VATICAN CITY, OCT. 6, 2006 (Zenit.org).- A theologian prostitutes himself when he subjects himself to the "dictatorship of common opinions," Benedict XVI told members of the International Theological Commission. The Pope delivered that message today in a homily during a Mass he celebrated in the Redemptoris Mater Chapel of the Vatican Apostolic Palace for some 30 theologians of the commission. "To speak to meet with applause, to speak oriented to what men want to hear, to speak obeying the dictatorship of common opinions, is considered a sort of prostitution of the word and of the soul," said the Holy Father quoting the First Letter of St. Peter. The theologian needs a form of "chastity," which implies "not to be subjected to such standards, not to seek applause, but to seek obedience to the truth," the Pontiff said. Benedict XVI continued: "And I believe this is the fundamental virtue of the theologian, this discipline, even hard, of obedience to the truth, which makes us collaborators of the truth, a mouth of truth, so that we will not speak in this river of words of today, but that we are really purified and chaste through obedience to the truth, so that truth may speak in us." Recalling an experience of St. Thomas Aquinas (1221-1274), the Holy Father explained: "In theology, God is not the object of our speech. This is our normal conception. In reality, God is not the object; God is the subject of theology." "He who speaks in theology should be God himself," said the Pope. "And our speaking and thinking should only serve to have him heard, so that the world of God can find room in the world." For theologians to attain this kind of purification, he recommended "silence and contemplation," which "serve, in the dispersion of daily life, to keep a permanent union with God." The Pontiff added: "This is the objective: that union with God be always present in our soul and transform our whole being." Silence and contemplation "serve to be able to find in the dispersion of every day this profound, continuous union with God," Benedict XVI continued. Yet, "the beautiful vocation of the theologian is to speak," he added. "This is his mission: in the talkativeness of our time and of other times, in the inflation of words, to make the essential words present. In words make the Word present, the Word that proceeds from God, the Word that is God." Islam is an Arabic word that can be defined as "to make peace." Islam is the religion founded by Mohammed, which considers the Koran as its holy book. In addition, Islam accepts the New Testament of the Christians and the Old Testament of the Jews as Divinely inspired works. Followers of Islam are known as Muslims (also: Moors, Turks, and Moslems) and, just as Jews and Christians, believe in only one God. Yet, over the centuries, Muslims have engaged in tremendous wars with Christians and Jews. It would seem that there is little hope for peace. However, Heaven's Peace Plan, involving Our Lady, is evidenced at Fatima, Portugal as well as other places around the world. The Moors once occupied Portugal. The village of Fatima was given the Islamic name of the well-loved Princess of the nearby Castle of Ourem. She died at an early age after marrying the Count of Ourem and converting to Catholicism. Baptized with the Christian name of Oureana, she was named at birth "Fatima," like many other Moslem girls, in honor of the daughter of Mohammed. Of his daughter, Fatima, the founder of Islam, Mohammed, said: "She has the highest place in heaven after the Virgin Mary." It is a fact that Moslems from various nations, especially from the Middle East, make so many pilgrimages to Our Lady of Fatima's Shrine in Portugal that Portuguese officials have expressed concern. The combination of an Islamic name and Islamic devotion to the Blessed Virgin Mary is a great attraction to Moslems. God is writing straight with crooked lines, as we will see. Fatima is a part of Heaven's Peace Plan. It is hope for the world. In the Koran, the holy name of the Blessed Virgin Mary is mentioned no less than thirty times. No other woman's name is even mentioned, not even that of Mohammed's daughter, Fatima. Among men, only Abraham, Moses, and Noah are mentioned more times than Our Lady. 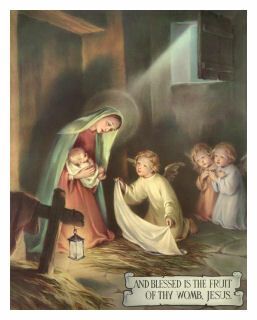 In the Koran, Our Blessed Mother is described as "Virgin, ever Virgin." The Islamic belief in the virginity of Mary puts to shame the heretical beliefs of those who call themselves Christian, while denying the perpetual virginity of Mary. Make no mistake about it, there is a very special relationship between the Blessed Virgin Mary and the Moslems! The Holy Land has been a real battleground between the Islamic peoples and Christianity over the centuries. Evidence of this are the numerous churches and basilicas that have been built by the Church, destroyed by, the Moslems, rebuilt by Catholic Crusaders, leveled again by the followers of Islam, and so on over the course of history. However, there is one remarkable exception: the Basilica of Saint Anne in Jerusalem. The Crusaders built this church and named it in honor of the mother of the Blessed Virgin Mary. In the Crypt of St. Anne's Basilica, a statue of the Infant Mary is venerated on what is believed to be the exact spot where Our Lady was born. Their great reverence for Our Lady precluded the Moslems from destroying her birthplace. The foundation for Heaven's Peace Plan at Fatima, Portugal, can be found in the Land of Our Lord Jesus Christ. As the Moslems swept through Spain in the 8th century, a great religious treasure was buried for safe-keeping in the earth, high in the Estremadura Mountains. It was a much venerated statue of Our Lady holding the Divine Child Jesus that was a gift of Pope Gregory the Great to Bishop Leander of Seville. After the overthrow of Moorish occupation, the image was uncovered in the year 1326, subsequent to a vision of Our Lady to a humble shepherd by the name of Gil. Our Lady's very special statue was enshrined in a nearby Franciscan Monastery next to the "Wolf River." The Moslems, during their Spanish occupation, had actually named the river. The Islamic term for Wolf River is "Guadalupe" (Guada = River; Lupe = Wolf). Hence, the famous Catholic image in Spain has been known, since the 14th century, by the Islamic name of "Our Lady of Guadalupe." In the fullness of time, we can be sure that Almighty God knew that the Islamic religion would pose a serious threat to Christianity. God also knew that the Spanish missionaries would face grave resistance in the "new world" from the mighty Aztec Indians. The Aztecs worshipped an evil stone "serpent god" that demanded human sacrifice. It was extremely difficult to win souls for Christ from these bloodthirsty savages. However, with God all things are possible. Our Lady appeared to a humble Aztec Indian convert by the name of Juan Diego in 1531. When asked her name by Juan Diego, at the request of the local bishop, Our Lady's response, in the Aztec language, included the words "te coatlaxopeuh" (pronounced: "te quatlasupe") and meant "one who crushes the head of the stone serpent." To Juan Diego and his fellow Aztecs, this revelation had great meaning, coupled with the miraculous image of Our Lady standing on top of a "crescent," the symbol of this evil serpent god. A tidal wave of conversions to Catholicism ensued. However, Bishop Zumarraga, who was from Spain, made what was no doubt a "heavenly mistake" that one day may lead to the mass conversion of Moslems. To the Bishop's Spanish ears, Our Lady's Aztec name of "Te Quatlasupe" sounded just like the name of the revered Madonna from Spain with the Islamic name, "Guadalupe." Hence, the bishop named the Mexican Madonna "Our Lady of Guadalupe." It is interesting that the "crescent" is also the symbol for Islam and that America's Shrine to Our Lady has an Islamic name. On October 7, 1571, a great victory over the mighty Turkish fleet was won by Catholic naval forces primarily from Spain, Venice, and Genoa under the command of Don Juan of Austria. It was the last battle at sea between "oared" ships, which featured the most powerful navy in the world, a Moslem force with between 12,000 to 15,000 Christian slaves as rowers. The patchwork team of Catholic ships was powered by the Holy Rosary of the Blessed Virgin Mary. Knowing that the Christian forces were at a distinct material disadvantage, the holy pontiff, St. Pope Pius V called for all of Europe to pray the Rosary for victory. We know today that the victory was decisive, prevented the Islamic invasion of Europe, and evidenced the Hand of God working through Our Lady. At the hour of victory, St. Pope Pius V, who was hundreds of miles away at the Vatican, is said to have gotten up from a meeting, went over to a window, and exclaimed with supernatural radiance: "The Christian fleet is victorious!" and shed tears of thanksgiving to God. What you may not know is that one of three admirals commanding the Catholic forces at Lepanto was Andrea Doria. He carried a small copy of Mexico's Our Lady of Guadalupe into battle. This image is now enshrined in the Church of San Stefano in Aveto, Italy. Not many know that at the Monastery of Our Lady of Guadalupe in Spain, one can view a huge warship lantern that was captured from the Moslems in the Battle of Lepanto. In Rome, look up to the ceiling of S. Maria in Aracoeli and behold decorations in gold taken from the Turkish galleys. In the Doges' Palace in Venice, Italy, one can witness a giant Islamic flag that is now a trophy from a vanquished Turkish ship from the Victory. At Saint Mary Major Basilica in Rome, close to the tomb of the great St. Pope Pius V, one was once able to view yet another Islamic flag from the Battle, until 1965, when it was returned to Istanbul in an intended friendly token of concord. At Lepanto, the Victory over the Moslems was won by the faithful praying the Rosary. Even though they had superior numbers, the Turks really were overmatched. Blessed Padre Pio, the Spiritual Father of the Blue Army, said: "The Rosary is the weapon," and how right he was! The Battle of Lepanto was at first celebrated liturgically as "Our Lady of Victory." 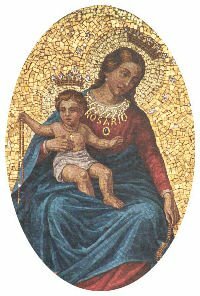 Later, the feast of October 7th was renamed "Our Lady of the Rosary" and extended throughout the Universal Church by Pope Clement XI in 1716 (who canonized Pope Pius V in 1712). And with that we are back to Fatima, Portugal where Our Lady, when asked her name, said: "I am the Lady of the Rosary." At Fatima, Our Lady taught us to pray the Rosary every day. Heaven presented its peace plan at Fatima and truly gave us hope for the world. Conversions were promised at Fatima: the conversion of sinners; the conversion of Russia; and what also appears to be the conversion of Islam. Our Lady of the Rosary, pray for us! 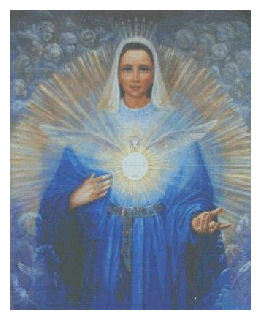 © 2001 The Blue Army of Our Lady of Fatima, U.S.A., Inc. The Blue Army of Our Lady of Fatima, U.S.A., Inc.
Today, Fr. Finegan posted on the care of altar linens. 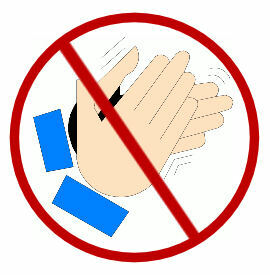 I had a request from DilexitPrior for information on washing altar linens. I thought it was worth a post because of the good links that people often give in the comment box. I don't consider myself an expert so if you have further advice or any useful links, please do chip in. Well, today before Mass I was reading from 201 Inspirational Stories of the Eucharist by Sr. Patricia Proctor, OSC. Most of the stories in the book are very interesting as you can imagine. However, one story in particular caught my eye. It was a story about an intern working on her certification as a lab tech. She tells that as she did her rotations in each department, distilled water was found on the countertops. Apparently, distilled water caused the red blood cells to burst so that the stain broke up quickly. After her internship was over, she was called to enter the convent and she was soon assigned to the laundry. During the course of her duties, she was responsible for the laundry of the sisters, the sacristy, kitchen as well as other parts of the monastery. 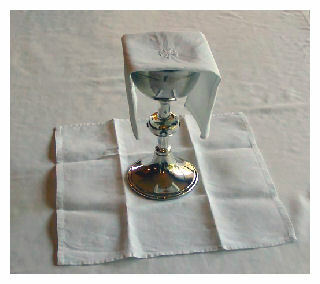 Of course, the sacristy linens, which are the corporal, the purificators, the finger towel, the alb as well as the altar linen itself, were washed separately from the rest because they come in contact with the Consecrated Host and the Precious Blood. As Fr. Finegan explains, there are certain ways of cleaning them. She explained how she carefully looked for what appeared to be wine stains on the linens, . However, she did not treat the stains like you would treat wine stains. Instead, she used distilled water on those stains. Well, those stains responded quite well to the distilled water she used to treat those particular stains. After all, after the Consecration, that is exactly what the wine becomes...the Precious Blood of our Lord. The story is entitled: Faith and Science Do Mix and it was written by Sister Coleen Byrne, OSC. The above is just one of the ones that Sunny of Faith and Country has posted on her blog. "It is I who am the bread of life" (Jn 6:34-35). Before the Feast Day dedicated to our Guardian Angels is over, I'd like to share a story Fr. Dave shared with us during the Homily today. He told us there was once a man who would always open the door and let his guardian angel go first. He would open the door and step aside. That is until the day of his ordination to the priesthood. He stepped aside to let his guardian angel go first. But he heard a voice tell him. "No, today, you go first".